"Culantro" redirects here. It is not to be confused with coriander, also known as "cilantro". 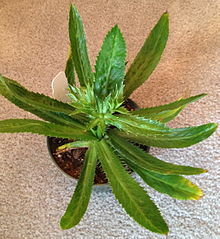 Eryngium foetidum is a tropical perennial herb in the family Apiaceae. Common names include culantro (/kuːˈlɑːntroʊ/ or /kuːˈlæntroʊ/), recao, shadow beni, Mexican coriander, bhandhania, long coriander, and ngò gai. It is native to Mexico, Central America, and South America, but is cultivated worldwide, sometimes being grown as an annual in temperate climates. 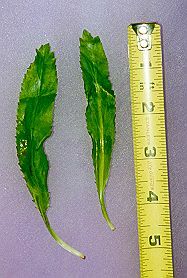 In the United States, the common name culantro sometimes causes confusion with cilantro, a common name for the leaves of Coriandrum sativum (also in Apiaceae), of which culantro is said to taste like a stronger version. E. foetidum is widely used in seasoning, marinating and garnishing in the Caribbean, particularly in Cuba, Dominican Republic, Puerto Rico, Trinidad and Tobago, Panama, Guyana, Suriname, and in Peru's Amazon regions. It is used extensively in Cambodia, Thailand, India, Vietnam, Laos, and other parts of Asia as a culinary herb. It dries well, retaining good color and flavor, making it valuable in the dried herb industry. It is sometimes used as a substitute for coriander, but it has a much stronger taste. In the United States, E. foetidum grows naturally in Florida, Georgia, Hawaii, Puerto Rico, and the Virgin Islands. E. foetidum has been used in traditional medicine in tropical regions for burns, earache, fevers, hypertension, constipation, fits, asthma, stomachache, worms, infertility complications, snake bites, diarrhea, and malaria. E. foetidum is also known as E. antihystericum. The specific name antihystericum reflects the fact that this plant has traditionally been used for epilepsy. The plant is said to calm a person's 'spirit' and thus prevents epileptic 'fits', so is known by the common names spiritweed and fitweed. The anticonvulsant properties of this plant have been scientifically investigated. [medical citation needed] A decoction of the leaves has been shown to exhibit anti-inflammatory and analgesic effects in rats. Eryngial is a chemical compound isolated from E. foetidum. The University of the West Indies at Mona, Jamaica, has investigated the use of enyngial as a treatment for human Strongyloides stercoralis infection (strongyloidiasis). ^ "The Plant List: A Working List of All Plant Species". Retrieved 1 October 2015. ^ "Eryngium foetidum". Germplasm Resources Information Network (GRIN). Agricultural Research Service (ARS), United States Department of Agriculture (USDA). Retrieved 21 January 2018. ^ "Culantro". WorldCrops. Retrieved 5 February 2019. ^ Ramcharan, C. (1999). "Culantro: A much utilized, little understood herb". In: J. Janick (ed. ), Perspectives on new crops and new uses. ASHS Press, Alexandria, Virginia; p. 506–509. ^ Singh BK, Ramakrishna Y and Ngachan SV. 2014. Spiny coriander (Eryngium foetidum L.): A commonly used, neglected spicing-culinary herb of Mizoram, India. Genetic Resources and Crop Evolution 61 (6): 1085-1090. ^ Paul J.H.A. ; Seaforth C.E. ; Tikasingh T. (2011). "Eryngium foetidum L.: A review". Fitoterapia. 82 (3): 302–308. doi:10.1016/j.fitote.2010.11.010. PMID 21062639. ^ "Atlas of Florida Vascular Plants". ^ Culantro. "Herbalpedia" (PDF). The Herb Growing & Marketing Network. ^ Simon, OR; Singh, N (1986). "Demonstration of anticonvulsant properties of an aqueous extract of Spirit Weed (Eryngium foetidum L.)". The West Indian Medical Journal. 35 (2): 121–5. PMID 3739342. ^ Sáenz, M. T.; Fernández, M. A.; García, M. D. (1997). "Antiinflammatory and analgesic properties from leaves ofEryngium foetidum L. (Apiaceae)". Phytotherapy Research. 11 (5): 380. doi:10.1002/(SICI)1099-1573(199708)11:5<380::AID-PTR116>3.0.CO;2-#. ^ Yarnell, A. "Home Field Advantage" Chemical & Engineering News, June 7, 2004. Volume 82, Number 23, p. 33. Wikimedia Commons has media related to Eryngium foetidum. This page was last edited on 11 March 2019, at 01:19 (UTC).